An innocent bank teller, suspected of embezzlement, is aided by an eccentric, wisecracking waiter. The Marx Brothers help young Broadway hopefuls while thwarting diamond thieves. Two turn-of-the-century baseball players, who work in vaudeville during the off-season, run into trouble with their team's new female owner and a gambler who doesn't want them to win the pennant. Toward the end of World War II, two American soldiers fighting in Southern France become romantically involved with a young, American woman. Her background will reveal more about them than her. A golf-crazy songwriter tries to avoid the long, solitary hours of concentration needed to produce a hit musical. His producer and his secretary conspire to get him back on track. A penniless theatrical producer must outwit the hotel efficiency expert trying to evict him from his room, while securing a backer for his new play. The Marx Brothers come to the rescue in the Wild West when a young man, trying to settle an old family feud so he can marry the girl he loves, runs afoul of crooks. The descendent of a ghost imprisoned for cowardice hopes to free the spirit by displaying courage when under duress. Two friends, who are members of a road crew employed by a Los Angeles power company, battle the elements to restore electrical power and trade punches over the same woman. Although Vivian Revere is seemingly the most successful of a trio of reunited schoolmates, she throws it away by descending into a life of debauchery and drugs. Don McGuire ... R.B. 'Bob' Pulsifer Jr.
Howard Freeman ... R.B. Pulsifer Sr. The Place Is Exploding With Laughter ! 'Hot Horse' Harris, the Bookie: There you are son, six grand, compliments of Chick Sloan. Johnny Dalton: That isn't my money. Nobody loans a thousand dollars without collateral and nobody gives away six thousand without a note, co-signers and six percent interest. 'Hot Horse' Harris, the Bookie: This is a new kind a bank - with horses. Think about it. 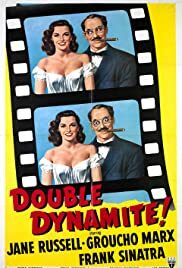 Sinatra, Groucho, and Jane Russell starring in a movie written by Harry Crane and with songs by Jule Styne and Sammy Cahn. Sound great. Well, it's not. Sinatra is a bank clerk who is wrongly accused of stealing money from his bank. His singing is great; it's probably never been better. However, instead of the flip Sinatra character of the 1950s, director Cummings asks Sinatra to play a timid young man, a role that never really suited him well. (Think about "The Kissing Bandit"! Compare that to "Meet Danny Wilson", Sinatra's next film where he gets to play that cocky guy!) Groucho is as funny as usual, but the script is contrived, there are too few sight gags, and the direction is slow. We are even cheated on the musical numbers. The two songs, "It's Only Money" (sung by Frank and Groucho) and "Kisses and Tears" (sung by Frank and Jane, accompanied by the jazzy Phil Moore Four) are good, but I wish there were more. Groucho did better with his brothers and Sinatra did better with Nelson Riddle!